Robed in elegant shades of green and purple, Christ stands holding a gospel book beneath an arch decorated with interlace. Below this portrait, a prayer has been written in a fine Carolingian minuscule, appealing for divine support. 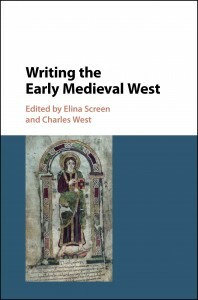 We chose this cover image for Writing the Early Medieval West because it neatly connects and ties together the book’s major themes. The late eighth-century manuscript from which our image is taken is now in Montpellier in southern France (Montpellier, Bibliothèque Interuniversitaire, Faculté de Médecine, H.409), but the great palaeographer Bernhard Bischoff – who taught Rosamond McKitterick, the book’s dedicatee – proved that it had been written in Bavaria, and probably at the monastery of Mondsee. The manuscript provides the text of the Psalms together with an interpretation, and its layout suggests strongly it was designed for personal study rather than for liturgical use. As McKitterick herself argued in her pathbreaking Carolingians and the Written Word, in a discussion of this manuscript as clear evidence for the lay ownership of books in early medieval Europe, it’s probable that the Psalter was in the possession of the family of Duke Tassilo of Bavaria. However, at some point before 792 the Montpellier Psalter’s final five pages were ripped out, and replaced by texts written by a Frankish, not Bavarian scribe. Those replacement texts include the final line of the glossed psalter, but then continue into a litany (prayers to the saints) and a set of laudes (liturgical acclamations). These prayers were for Pope Hadrian and the ruling Frankish family: Charlemagne, his sons and his queen Fastrada. The most likely interpretation is that this Psalter left Bavaria in 788 when Tassilo did – when Charlemagne took over Bavaria, and consigned his Bavarian cousins to perpetual monastic imprisonment. Presumably the book’s final five pages were removed in Francia. We shall never know what they contained, but we can assume that it was something connected to Tassilo’s authority, which would explain why they were replaced with prayers focused on the Carolingians. The mutilation of this manuscript as a kind of damnatio memoriae is paradoxically an illustration of the power of the written word in early medieval Europe. Nevertheless, it is possible that after this violent treatment, the book remained in the hands of Tassilo’s family in their monastic confinement, because the laudes ends with a short prayer: “Grant to me o Christ Sister Rotrude by name that she may be blessed and serve you forever”. Which of the several Rotrudes this was is impossible to know, but the most intriguing possibility is Tassilo’s own daughter, who became a nun at Laon. There she would perhaps have been able to continue studying this family book in her unfamiliar new surroundings – certainly more pleasant reading than the copy of his own deposition document that was assigned to her father. War booty, family heirloom, devotional handbook, symbol of faith, educational manual, and anchor for religious and political authority: the Montpellier Psalter is a manuscript that reminds us that the early medieval written word played many different roles in a complex and changing world. No-one has demonstrated that better than Rosamond McKitterick, to whom the editors and contributors, all former students of hers, are pleased to dedicate this collection of studies.